The ASA Accreditation Program (ASAAP) is a 36 month audit program based on the ASA-100 Standard. The standard was created to comply with the FAA Advisory Circular (AC) 00-56, the Voluntary Industry Distributor Accreditation Program. ASA-100 emphasizes issues such as impartiality, competence, and reliability - all specific to the regulated needs of the aerospace industry. 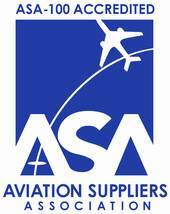 ASA's experienced auditors have all worked in the aerospace industry for air carriers, repair stations, manufacturers, distributors; and have extensive experience in the aviation regulations and industry business practices. Click here to view the steps to becoming accredited. On September 5, 1996, the FAA published Advisory Circular (AC) 00-56, titled, "Voluntary Industry Distributor Accreditation Program." The purpose of this Advisory Circular was to describe an accreditation system for civil aircraft parts distributors on the basis of voluntary industry oversight and provide information useful for developing an accreditation program. As a strong proponent of the voluntary accreditation program, the Aviation Suppliers Association assisted the FAA in writing AC 00-56, and, as a result, developed its own quality system standard, ASA-100. The ASA-100 Quality System Standard has since become the leading quality system standard under FAA AC-0056. AC 00-56 is at revision level B, released on 2015-May-27 with AC 00-56A closing on 2015-August-27. ASA-100 is currently at revision 4.0 with release date of 2015-August-1. All ASA-100 audits conducted after 2015-August-26 will be conducted to revision 4.0. As companies move through their surveillance or recertification audit cycle the companies will be audited to 4.0 meaning current certificates to ASA-100 rev.3.6 and/or FAA AC 00-56A are valid until the next audit and no later than 2018-August-26. Most if not all ASA-100 certificates issued to rev 3.6 will be changed to rev 4.0 by 2017-January-01.